naomi: today is st david's day, the patron st of wales. i bought some daffodils (wales' national flower) and i might even eat some leeks today. it's also sunny here for the first time in ages. it feels like spring and the bus stops are all empty because everyone wants to stay here, by the beach and not leave like usual. marie: today was a sunny day, portrayed here by pink-tinged film. this is milwaukee county transit system's route 51, at oklahoma and new york avenue. 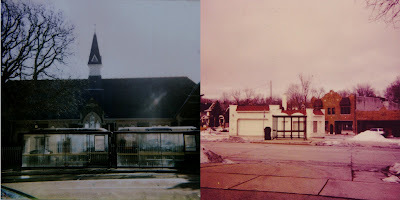 i grew up about 100 blocks west of this very bus stop. my first city bus ride was to uwm in 1999 on this route, from west allis (a 45 minute feat, and o-so-tiresome at 6am and again at 10pm). my only car accident at the tender and impressionable age of 17 occurred on oklahoma avenue, in west allis. my best friend and i were on our way home from a highway cleanup for key club. i totaled my dad's minivan and the other driver's new honda civic. the point of all of this reminiscing over a bus route is that my first home proudly sits on the same street that played such a role in my childhood. who would have thought? not me.